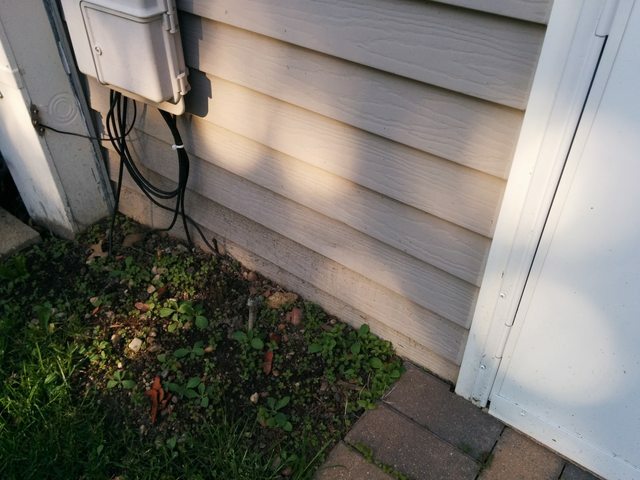 I would like to add a new cable outlet to an outside wall and wanted to find out what kind of drill bit is needed to drill through and feed the coax cable as well as anything else to be mindful of. Comcast wanted $70 for a new outlet installation ($30 install, $40 tech visit), so I figured I could do it myself. The part that I'm most unfamiliar with is how to properly weather seal it. The outside just has vinyl siding and there's no electrical outlets nearby. I'd drill from the inside out. 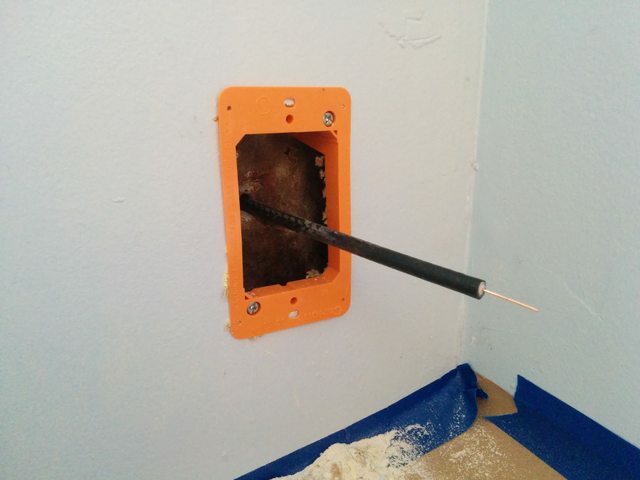 Cut a hole in the drywall where you want the terminal. Cut the hole so that a "low voltage" bracket will fit. 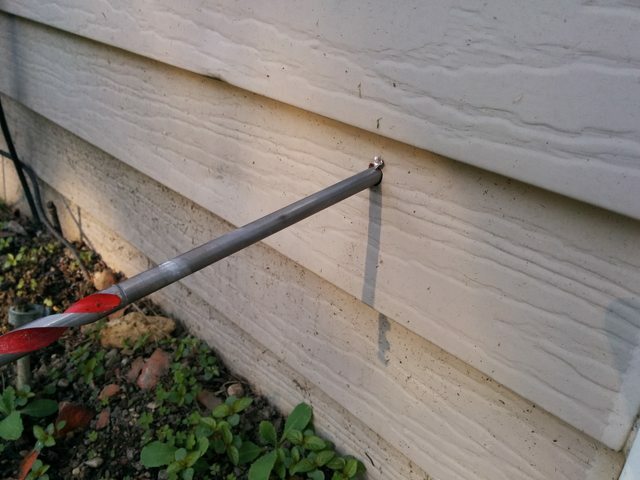 If it's a 2×4 stud wall, your bit will only have to be ~5" long. Drill a hole in about the center of the drywall cut out. 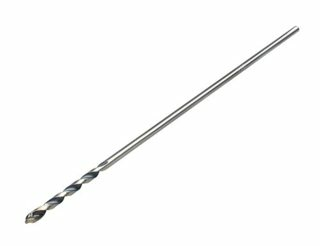 You can use a 3/8" installer bit, which is ~20" long and has a hole on the end to aid in pulling the cable. 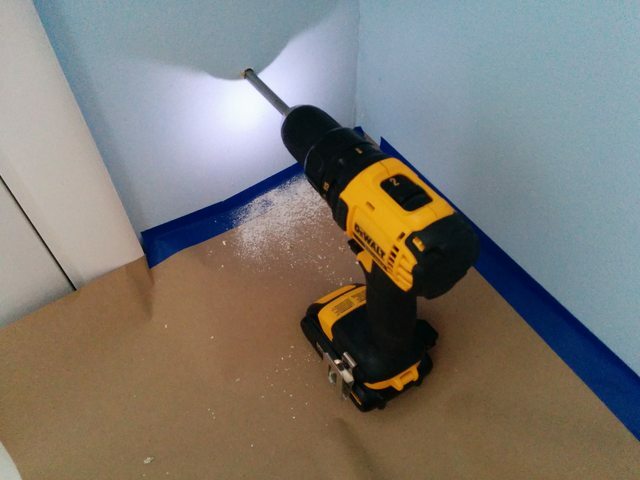 Drill through the wall with the installer bit. Remove the bit from the drill (leaving it in the hole). 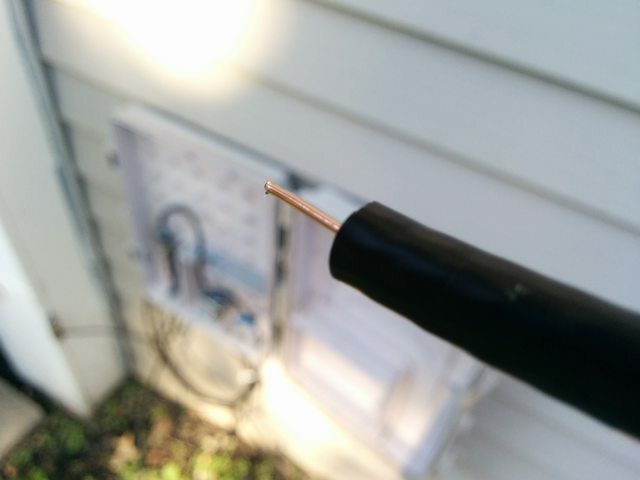 Go outside and (or have a helper) connect the cable to the end of the installer bit. Back inside, pull the bit and cable back through the hole. Fish the wire from the outside junction, through the newly drilled hole (if you haven't already). Add ends to the cable, and connect the end at the junction box outside. 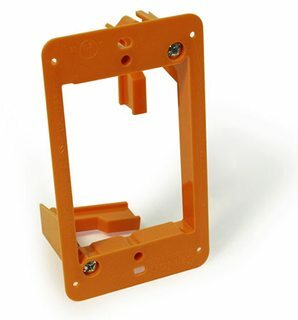 Connect the other end to a faceplate of your choosing, and mount the faceplate to the "low voltage" bracket. 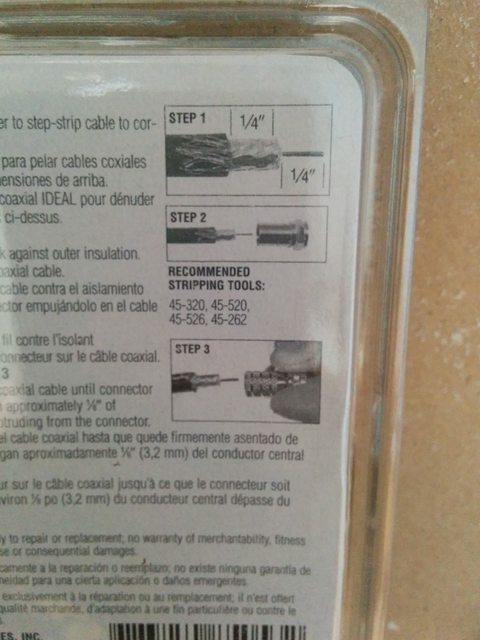 After following Tester101's answer, here is a detailed step-by-step with pictures of how I fed the cable. On the outside, the cable will go into the cable box which is conveniently located about 2 feet away. 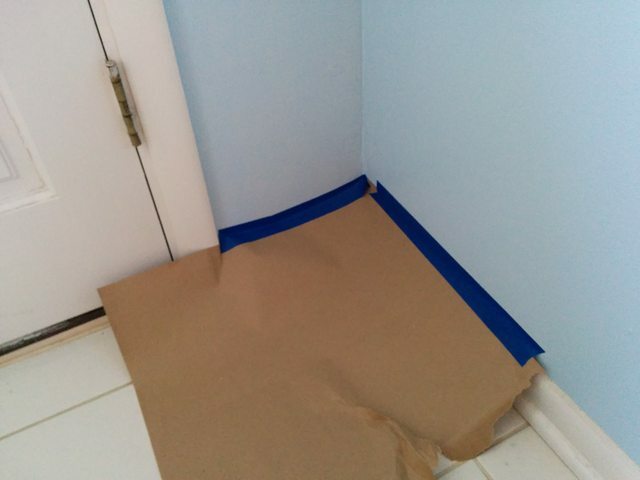 I picked a spot that was in between the door frame and opposite wall to start drilling, about a foot above the ground. Comes out clean on the outside. You'll want to leave the bit sticking out so you can feed the coax back inside. I took some existing cable and cut one of the ends, exposing the inside wire for better handling when feeding it back through the wall. 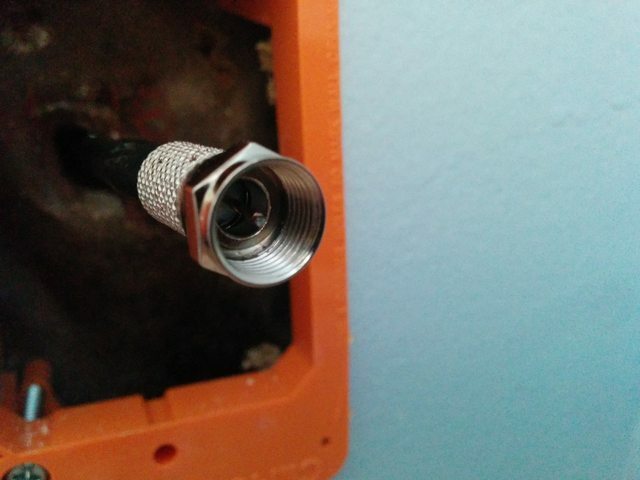 I fed through the exposed end of the coax from the inside of the cable box so that the end with a connector can be added to the splitter. 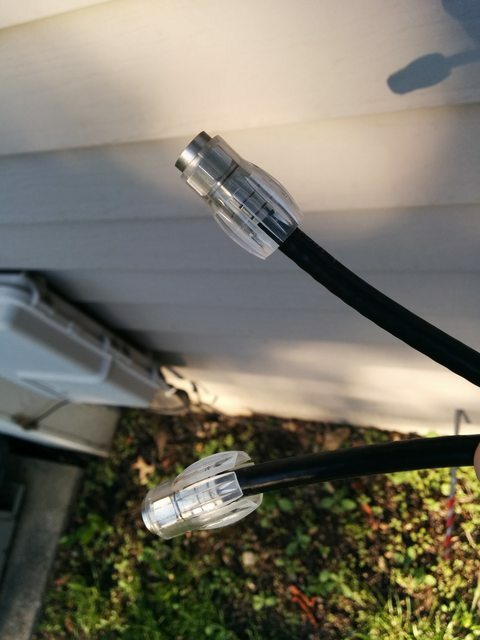 At this point, you may need to add the 3-way splitter if you don't want to replace an existing connection. 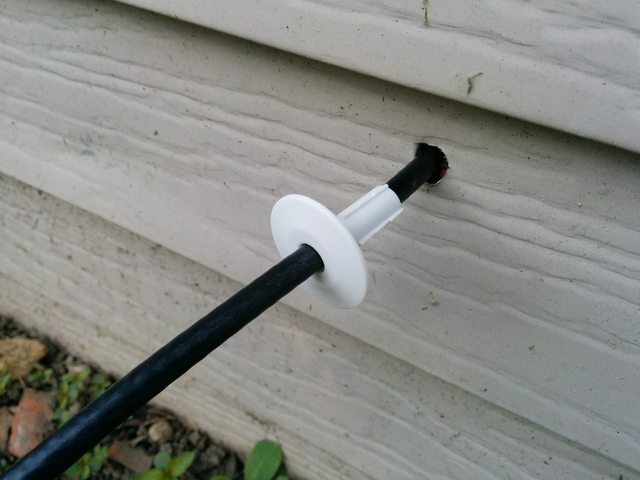 Before we feed the coax cable back inside, slide the plastic bushing onto the coax cable. It's time to tape the cable to the bit to feed back inside. 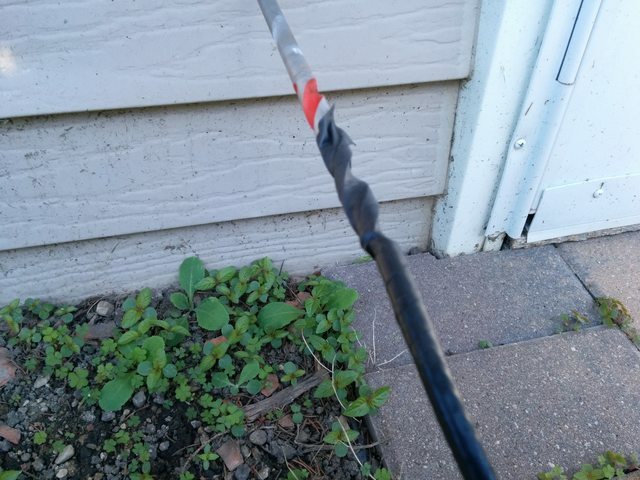 Using electrical tape, tape the coax cable to the bit. Pull the drill bit back thus pulling the cable through the wall. 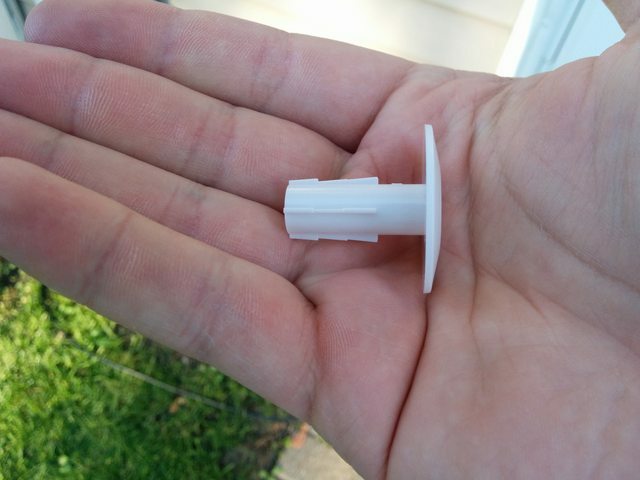 Press the plastic bushing into the outside wall. You may need to enlarge the hole slightly to push through the bushing. Cut the drywall and fasten the low voltage bracket. 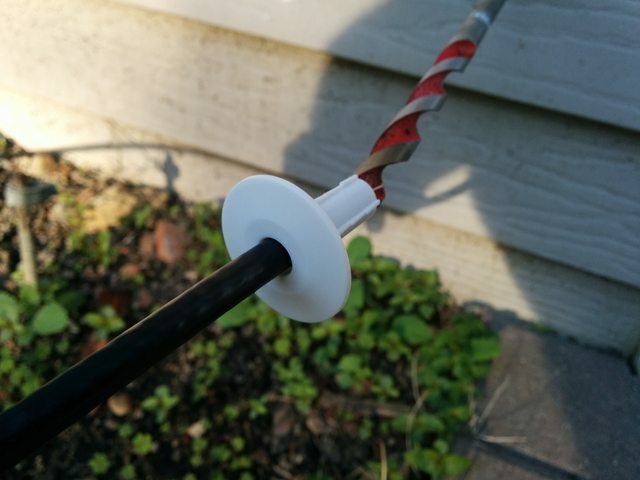 Strip the coax cable and fold the wire shielding against the outer insulation. 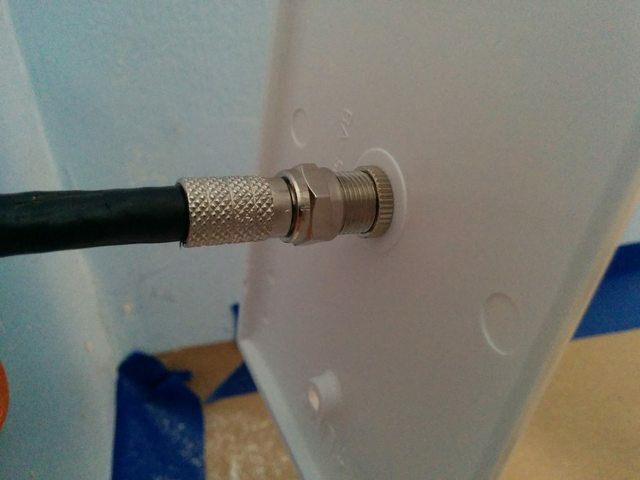 Push the connector onto the coax cable and twist the connector until the connector is firmly sealed with approximately 1/8" of center conductor protruding from the connector. 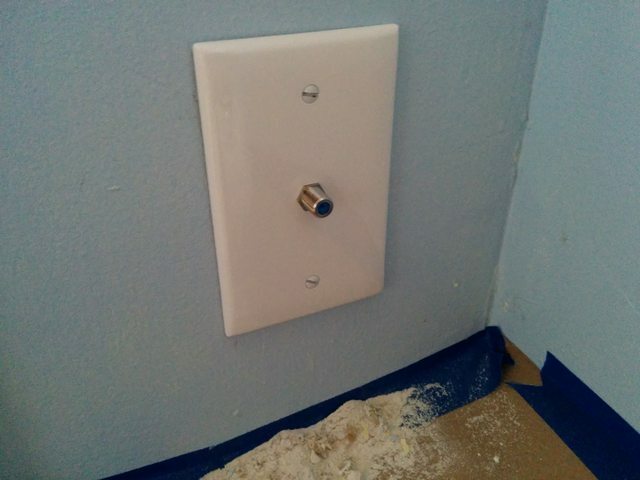 Connect the coax to the back of the wall plate. Secure the wall plate to the bracket. Using a screw driver, I bent the coax to ensure it bends down as it enters the plastic bushing. 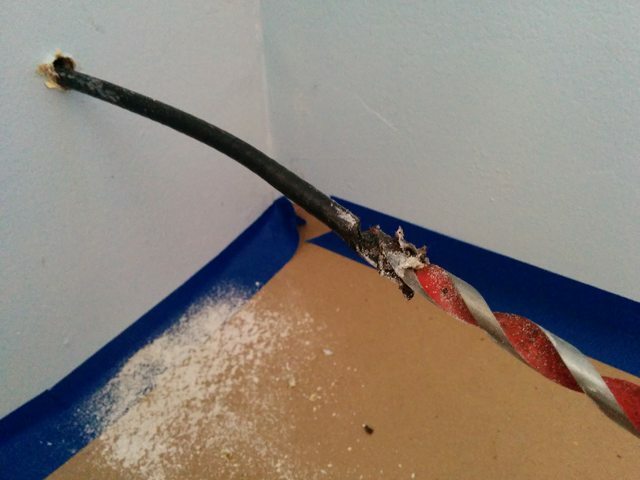 Use the cable manufacturer's minimum bend radius to bend the cable to insure you don't damage it. I then used the silicone around the bushing as well as around the coax. 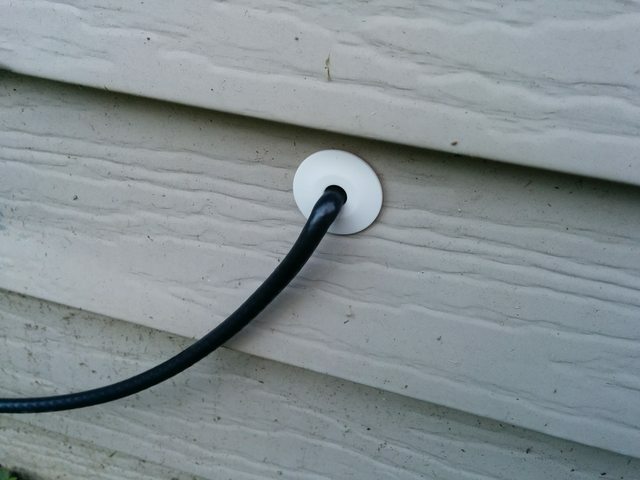 That is why on the outside the USE those grey cable boxes, it allows protection of the cable coming up straight from the ground near the house, inside of it using an L connection for the bend, or just room to curve, and then enter the house. Any feed with out protection that doesn't come straight out near the house will get damaged eventually if not immediately. Always seal well, near the coax and on the outside lip of the brushing if doing it this way, or any possible crack behind the cable box and inside. Reason? Ants (and pests), air and water (weather). On the inside of the coax you can caulk it also, for same reasons, before putting on plate. Just make sure it's a thin layer not to push out the plate. 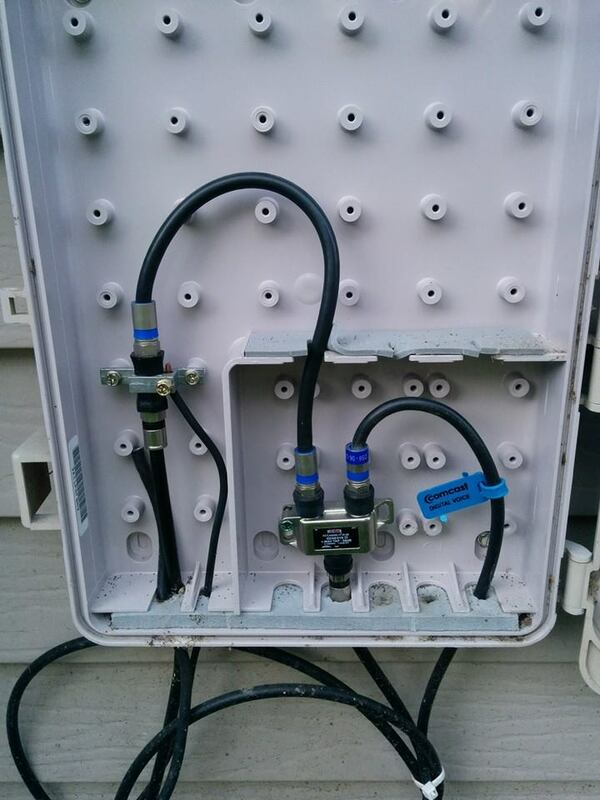 The service provider has installed a 1-way TAP which insures the modem has a very clean signal from the "OUT" terminal, while TV's are fed from the "TAP" terminal have normal attenuated signals. While everything described in the OP's preparation and step-by-step list is good, this minor overlook can be critical to the overall system. 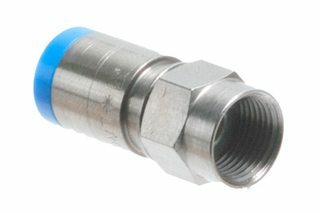 To remedy this, the OP would purchase a two-way splitter and connect it to the TAP terminal output. 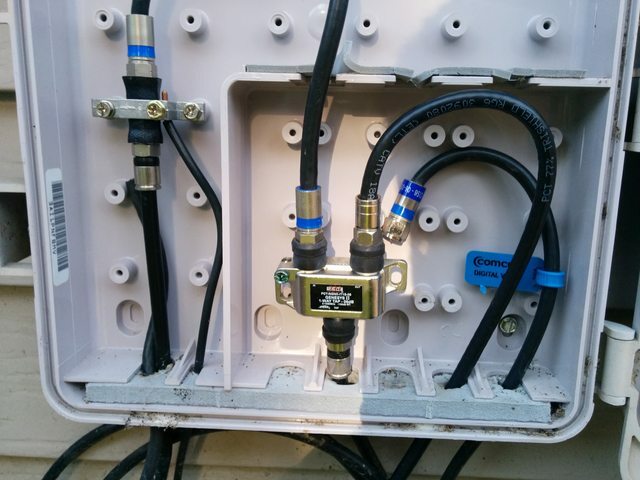 Then the existing TV coax and the new coax would connect to the splitters two outputs. Not the answer you're looking for? 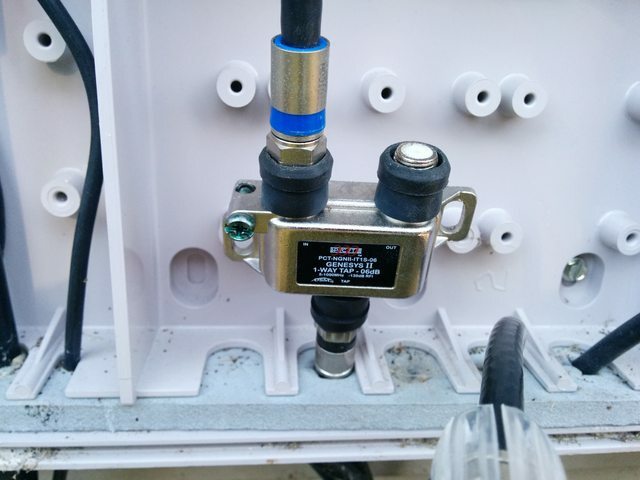 Browse other questions tagged wiring exterior coax or ask your own question. What do I need in order to fix the sloppy work done by cable providers? 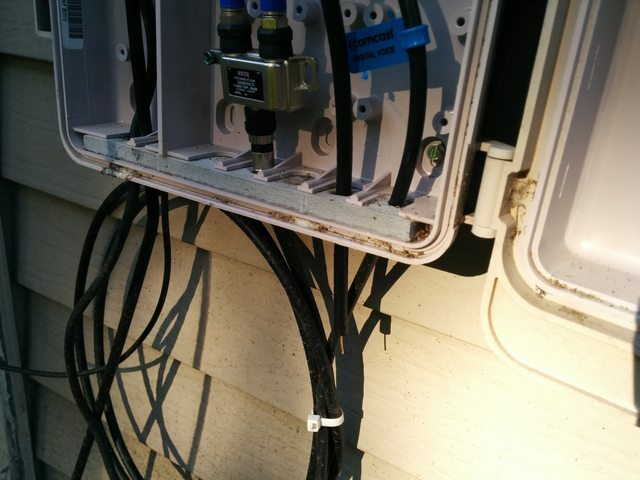 How do I protect a coax cable junction from outside weather? 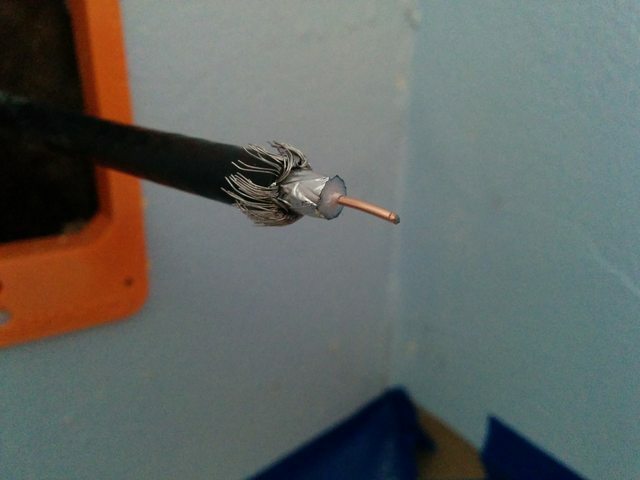 How important is it to avoid nicking the center core of a coax cable? How can I locate a wall from a crawl space? 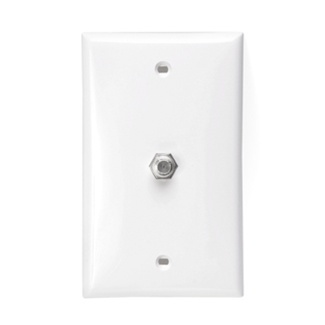 My question is, is this a possible/valid way to add a “hidden” outlet for outside IP camera?